Spearheaded by CLAPA, Cleft Lip and Palate Awareness Week will run from May 12-19. One of the most common birth anomalies in the world, cleft lip and palate (CLP) is a congenital condition which happens in the first three months of pregnancy. It affects the upper lip and the hard and soft palate of the mouth. 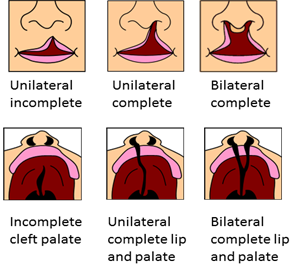 A cleft occurs when the parts which make up the lip and palate fail to fuse properly. In some countries such as India and Peru, cleft lip and palate occurs in one of every 500 births. Despite extensive research about CLP, its causes are still unknown. The condition affects a child’s appearance, speech, teeth, eating, hearing and ability to develop socially. Children born with CLP need the help of a multidisciplinary medical team to treat all of the problems associated with clefts that may develop. Want to help raise awareness? Here’s how! Attend our event on May 16. Live in the UK and want to help? Check CLAPA’s website.